Both of these teams will be looking to improve on their opening perfomances. For many pundits, this match features the teams who will qualify from a very tough group. Portugal and Denmark now have three points each, as do Germany. Holland need a win here to have any chance of qualifying and Germany will be looking to wrap things up before facing the upstart Danes, who were unlucky to lose to Portugal earlier today. On form the Germans should win, but surely Holland will be a much improved team, and surely they won’t be plagued by bad luck, as they were in their first game. Of course, the cliche goes that you make your own luck in football, and the Dutch certainly have to do that if they want to beat Germany. Favourites to lift the trophy, Germany didn’t really look all that good in their opening game. They won, but it was far from the performance you’d expect from a team of their quality. They don’t need a win as badly as Holland, but they will want to show what they’re really capable of. And, of course, there’s the famous rivalry. This means a lot to both teams, some of you may be old enough to remember the infamous spitting incident in 1990, when Frank Rijkaard spat in Rudi Voller’s hair. The rivalry is so well-known that it has it’s own wikipedia page. Serious business. Expect a hard-fought game. Germany: Germany: Neuer, Boateng, Hummels, Badstuber, Lahm, Khedira, Schweinsteiger, Muller, Ozil, Podolski, Gomez. Subs: Wiese, Gundogan, Schmelzer, Howedes, Schurrle, Klose, Bender, Mertesacker, Kroos, Gotze, Reus, Zieler. Willems, Nigel De Jong, Van Bommel, Robben, Sneijder, Afellay, van Persie. Subs: Vorm, Bouma, Kuyt, Huntelaar, Vlaar, Schaars, Strootman, Luuk De Jong, Narsingh, Boulahrouz, Van der Vaart, Krul. Robin Van Persie misfired repeatedly in the opening game for the Dutch, surely one of the best players in the premier league this year won’t repeat that. Philipp Lahm is one of the best defenders in the world, and should keep the Dutch at bay while building attacks from the back. 29 degrees in the stadium according to RTE. We’re about 10 minutes from kick-off here, so get a beer/cuppa and enjoy the game. The teams are on the way out now, anthem time at Metalist Stadium. As good as Neuer is, I quite miss Ollie Kahn, what a legend he was. If you have anything to add to the blog, any comments, tweet me @landsleaving. I’ll be keeping an eye on twitter through the game. Germany pressuring straight away, pushing up into the Dutch half. Holland keep the ball and a lobbed pass reaches Van Persie in the German half. Holland move the ball back, maintain possession until Van Persie is played through by Sneijder at the edge of the German penalty area. The Arsenal striker can’t reach the ball and fall. Germany now in control of possession, but their one-touch passing loses them the ball in Dutch territory. Both teams look like they want to control possession and build slowly. Teams, stop tiki taking, you are Dutch and German, you are not Spain. Neither team really asserting themselves here. Ball staying in midfield. Germany look a little more comfortable on the ball. Holland get a wonderful chance as Van Bommel lofts a pass over the entire German defense to Van Persie, who’s onside. He can’t quite make it to the ball and taps a weak shot directly at Neuer. Robben looks like he’ll cause trouble for Lahm down the right side. Badstuber had to make the tackle after Lahm was beaten. Sneijder plays the ball to Affelay on the right of the German penalty area. He drills in a low cross, but it’s far too close to Neuer who gathers it without any problems. Robben intercepts a poor Podolski pass and makes a run through the middle of the field, slotting a pass to Van Persie who sends it low and right, but it’s well wide. What’s wrong with Robin? Lahm looks very positive, pushing forward and linking well with Podolski on the left. Some nice passing sees Ozil in the Dutch penalty area, who runs directly into Mahijsen and falls down. The referee waves off the frankly absurd penalty shouts. A Dutch corner is sent in high, Mathijsen can’t quite reach it. It leads to a Dutch throw which is sent back down the field as Holland look to control possession. Another long ball to Van Persie on the right of the German penalty area. He cuts inside but Boateng is able to put the ball out for a corner. Besides his finishing, Van Persie is looking dangerous. If he could shoot straight Holland might actually win this. Muller lobs in a cross from the right, Podolski can’t make anything of it and ignores the obvious pass to Schweinsteiger. Holland break through Affelay and win a corner at the other end. The corner goes over everyone in the box and results in a German throw. Badstuber gives Robben a wallop to the head accidentally as they go up for a high ball. Owch. Robben walks off for what might be a few stitches. Poor Robben, if only Goodstuber had played. Jogi Low has made friends with a ball boy. Ah bless. Intesting fact #2, when commentators give interesting facts it means nothing is happening. Robben, back to Robben again being the latest from the RTE team. I love puns. But only good ones. Germany take the lead through Gomez. Muller plays the ball from the right in to Schweinsteiger, with acres of space outside the Dutch ‘D’ he threads a pass through the Dutch defense to Gomez who takes a touch, turns, then slots it cooly past Stekelenburg. Great finish, well worked goal. Van Bommel makes a run from the centre of the field and plays the ball to Robben on the right who looks up and has a man in the box. Flag is up, offisde against Robben. The Dutch still look dangerous here, Germany not so much, despite the goal. Germany starting to look more lively now, pushing down the right wing. Muller from the right sends a low cross into the penalty area, but Gomez doesn’t reach it under pressure from Heitinga. The Germans look in control here. Khedira bundles over Van Bommel in the German half and sends a long ball forward toward Gomez, but the flag goes up on what looked a good chance for Germany. Huntelaar on the bench again looking grumpy. He’s always so grumpy. I should remind you, he is a Dortmund fan. Willems takes Muller down on the right as Muller makes a run. Free to Germany which is basically a corner. Ozil will take it. Brilliant, brilliant cross to Badstuber, who is all alone in the six-yard box and heads it directly at Stekelenburg. Poor effort. Again, if only Goodstuber was fit for this match. Gomez again, he picks up the ball on the right of the Dutch penalty area, plays a lovely one-two, getting the ball back at the corner of the area and placing a perfect shot into the left corner of the goal. No chance for Stekelenburg. Huntelaar is grumpily warming up already. Holland are out if they lose. Sneijder takes a Dutch corner, tries to be clever and seeks out the pass to the outside of the box. It’s easily intercepted and Germany break, but fail to capitalise. Holland look seriously rattled. They’re making poor passes, half-time needed badly for them to get back into this after the break. Willems reminds Ozil Holland are there with a big hit on the right of the pitch. Germany win a free, Schweinsteiger takes it, but it’s headed away by Heitinga. Germany go forward again and win a free kick on the opposite side. Schweinsteiger takes it, sending a looped ball dipping toward the top right corner, forcing Stekelenburg into a leaping save. He puts the ball behind but there won’t be a corner as the whistle is blown for half-time. Germany look comfortable now, two goals ahead. It’s hard to see Holland coming back into this at all, they seem completely disheartened after two Gomez strikes. It’ll take some serious motivation from Van Marwijk to get them back into this. They need more from their stars, Van Persie is off his game and Sniejder can’t seem to keep his passes on target. Germany are through with the win, so expect some defensive play in the second half. They have no need to stretch themselves now and will probably slow the pace to keep themselves fresh for the next game. Holland, this tournament’s France thus far. Germany not working too hard, yet winning by two. If ever a team matched their national stereotype it’s Die Mannschaft, who are playing with the efficiency of a BMW factory. Do people seriously still watch Entourage? It’s awful. The 3 ads are fun, not amazing, but fun. John O’Shea seems lovable. Go away Heineken man, I really hate you at this point and have taken to drinking Carlsberg instead of Heineken for the duration of the tournament. Not because of the ad mind, it’s €1 a can in the local shop. Kia, your car is not a football match, people don’t cheer it. And if it has what I like in it, it’s full of cheese and cola. Which is a terrible idea for a car. A fat pigeon in my garden is knocking over a birdfeeder. Not an ad, but still, it’s better than seeing that respect ad again. Van Bommel is off, Van Der Vaart is on. Affelay is off for Grumpelaar. And we’re back on. Van Der Vaart can be a game changer, so it’s a positive move, but it could be too little too late. Schwinsteiger with a free tries to play in a cross to the Dutch area, wins a corner which is headed around the box until Huntelaar takes it up the pitch. He then loses it instead of passing. Huntelaar a ‘caged lion’ according to RTE, I saw him as a poor man’s incredible hulk. Not Hulk the player, just a big grumpy bloke who’s a bit awkward. Orange though, not green, obviously. Gomez down injured, after a collision with Heitinga. Not much of a hit, but Schweinsteiger might have picked up a knock. Finally Holland attack. Sneijder makes a run down the left and sends a poor ball in which is easily cleared. Honestly had forgotten Podolski was playing until he chased a ball into the corner in Dutch territory. Better from Holland now, Van Der Vaart stepping up to control the Dutch passing game. They need more from the players around him now. Hummels (yeah ok Martin, he’s good) makes a tremendous run through the middle unopposed. He shoots from the Dutch D and it’s saved. He moves in from the rebound and Stekelenburg saves with his fingertips. The Dutch final ball is really quite awful. Every time they go forward they’re undone by bad passing. This is Germany’s to lose. Podolski gets the ball from Ozil in the Dutch penalty area and spins once, twice, sends it back to Ozil, who’s offside. He’s looking for a transfer to the Bolshoi. Holland with a corner, Sneijder sends it in to Mathijsen who heads over, meekly. Van Persie shoots from just outside the outside of the box, bringing a great save from Neuer. Finally the Dutch doing some good work, passing and keeping the ball. Spoke too soon, Germany pick up a poor pass and move forward again. They’re just holding on to the ball now, slowing things down again, keeping Holland from getting anywhere. Playing the clock, as they say in American Football. RTE saying they want to score another one. Think we’re watching a different match, I’m seeing a team who want to just keep the ball as long as possible. Sneijder on the right just outside the German area takes it around Boateng and fires a shot wide to the right. He looks for a corner, but it didn’t take a deflection. More bad passing gives Ozil the ball who dribbles up about half the pitch, then plays it wide to Muller on the right, who can’t keep the ball. Germany win a corner, but Holland win it back after the ball floats over the box. Holland just aren’t getting anywhere when they go forward. A good series of passes sees Robben loose in the box, but the pass from Sneijder slides by him and goes out for a goal kick. The final ball has let them down consistently tonight. Holland are chasing this game to the point of exhaustion. The Germans are able to just pass it around. It’s just not looking like Holland can do anything. As if to prove that point, Sneijder plays it in to Robben who’s inside the German area. He turns on the ball, has space, but fluffs the shot wide and right. He looks a beaten player. Germany break down the left and Gomez sends the ball across an empty box. Robben with a great run, trying to prove me wrong, breaks down the right and sends it across the pitch to an unmarked Sneijder on the left. He shoots and Boateng slides in to block with his face. Looks painful. Holland win the corner and Gomez, the goalscorer, is able to clear it. And now hes off, Gomez heads off to be replaced by the man he took the job from, Miroslav Klose. Holland, from nowhere, have given themselves a chance. Van Persie shoots with power through the legs of Badstuber after taking the ball in from the left and sends it past Neuer into the bottom right corner. Van Persie goes forward again but this time Hummels is able to put it out of play before the shot. Ozil plays a nice one-two to put himself in the box, tries to turn around De Jong who clears expertly. Holland look much more positive now. Huntelaar is actually trying to come into the game. He may even crack a smile. Van Persie goes down in the German box after some good build up play from Van Der Vaart and Sneijder, who are winning the ball well in midfield. No penalty, Van Persie fell into Hummels. Germany move forward again, but Ozil shoots into a Dutch player, they break but Lahm wins it back. The pace his really picked up here. De Jong stops play with a foul on Lahm, picking up a yellow card. Toni ‘Tom’ Kroos is on for Ozil. RTE calling him ‘crows’ which totally ruins my pun. He just walked off and didn’t look back. Poor performance from him, and a poor reaction. Heitinga bounds forward and passes to Kuyt, far too hard, Kuyt can’t control it and Germany retrieve the ball. Van Der Vaart shoots from distance, not a terrible effort, but it was never going in. The permutations for Holland to go through if they lose this game are absurd. If they lose they can still go through, but they need to win and Denmark to lose to Germany, and to score a few. It’s just too unlikely. Top Gun Kroos plays it to Muller who wins a corner, after wasting time in said corner. Cocktail takes the corner and off Mullerice goes into the corner again. The ball is passed back to Stekelenburg, who tries to skow off his ball skills and nearly gets dispossessed by Klose. What a time to try something like that. He’s been a liablilty tonight. Willems picks up a yellow card. Germany continue to pass it around and keep Holland away from the ball. Muller goes off for a celebratory Yop and he’s replaced by Bender. Not to be confused with the robot from Futurama. Van Bommel and Robben are sitting together on the sidelines looking sad. Aww. Poor pets. Germany anxious to ‘no longer be the bridesmen of international football’ – RTE. And that’s that. 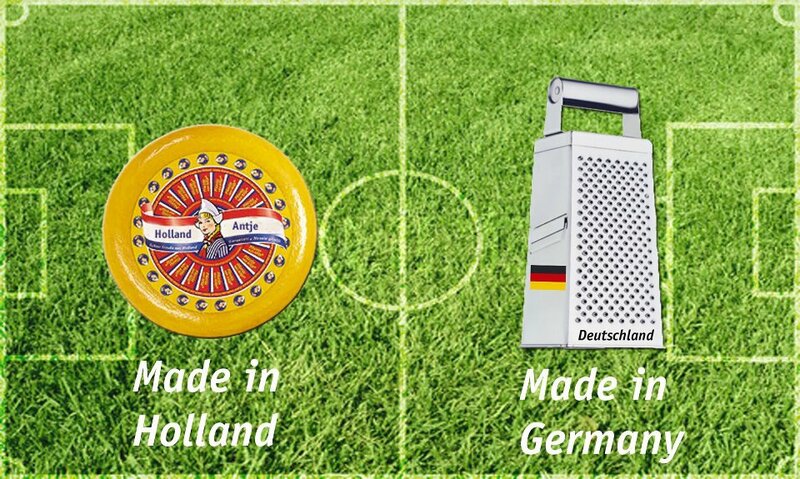 Holland are surely done and Germany show they can control a game with ease. Deserved win for the Germans, who look like they’ll be a danger to any team in the tournament. So if Germany beat Denmark, and Holland beat Portugal, and lots of goals are scored, and the fickle footballing gods smile upon the Dutch, they could still get through. But they won’t. The stereotypes are the most important part. And the crap jokes. Being good at bad jokes takes a very specific lack of talent. Rumours are that Goodstuber will be called into the squad as an emergency replacement for his evil twin when Germany play Ireland in the final. Angela Merkel’s request, apparently.